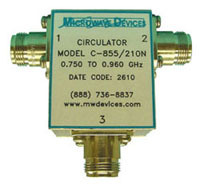 The following table outlines many of the models in our standard bandwidth circulator line. We can provide many others, based on customer-specific requirements. MDI is always ready and willing to work with you to fulfill your needs for circulators. Frequencies to 40 GHz or higher, as well as higher isolation units are also offered. Consult factory.